This post is making me so happy...and I'm only on the first sentence. ;) Today, we're talking about a fantastic new cookbook, we're talking about chocolate chip cookies...and well, we might even see a fluffy kitty. See? So much to be happy about. 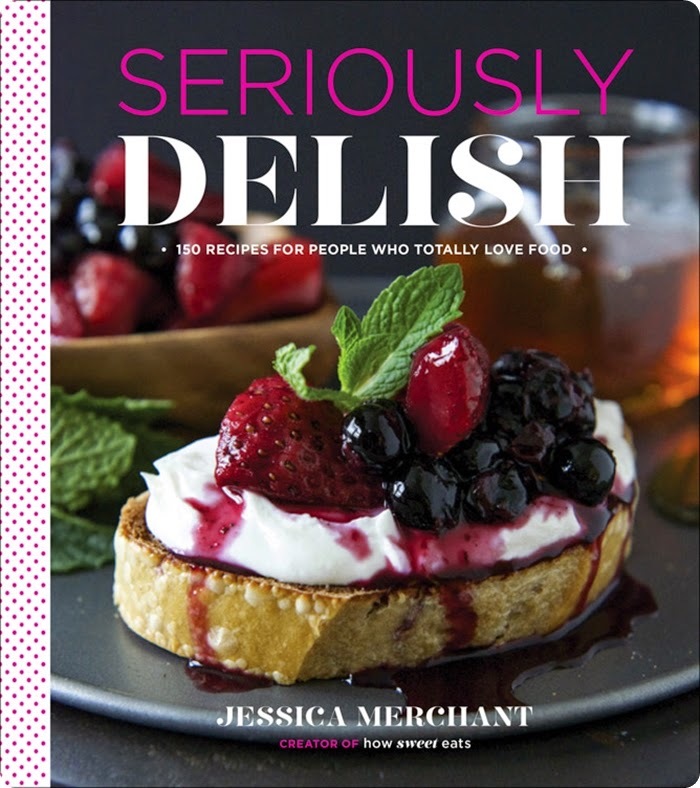 Seriously Delish: 150 Recipes for People Who Totally Love Food is the first cookbook (I predict of many) from Jessica Merchant of How Sweet Eats. I've been a fan of Jessica's for...forever. I love her recipes, many from her blog have become staples in our house. I love her fun style of writing. I love that Jessica LOVES FOOD. I've already made 4 recipes from her book...we have loved each of them. Last week, kiddo had a friend over for dinner and I made the Green Chili Turkey & White Bean Enchiladas. I think we demolished the entire pan in 5 minutes. So good. We'll be talking about those Whole Wheat Chocolate Chip Cookies more in a minute. When I read it, I really felt like Jessica was hanging out with me in my kitchen. Such an engaging and personable read...I love that in a cookbook. The photography is beautiful. Not only did Jessica develop the recipes, she did her own photography. Multi-talented, that one. Jessica has this knack for creating recipes that are unique and modern and fresh, but still keeping them simple enough to make every day. Next on my list: Amaretto-Butternut Squash Soup with Cinnamon Toast Croutons (!!! ), Parmesan-Pistachio Kale Chips, and the Fleur de Sel Caramel Bourbon Brownie Milkshakes (oh. MY. gosh.). Spike was very interested in the Buffalo Chicken Pizza. He REALLY likes this book. The cookies. In my option, there is nothing better than a chocolate chip cookie. Nothing. Well, maybe the dough before it's baked, but basically nothing. A cookie that is made with whole wheat and oat flour, though? That might even be better than the original. I felt so good about eating all that whole wheat that I ate a few extras purely for the health benefits. You say multi-vitamin, I say cookie. Tomato, to-mah-to. Preheat oven to 350. In a bowl, whisk together the flours, baking soda, and salt. Set aside. In the bowl of your electric mixer, beat the butter on medium until smooth and creamy. Add both sugars and beat on high speed until fluffy, 3 to 4 minutes. Add the egg, egg yolk, and vanilla extract and beat until combined, another 2 to 3 minutes. Make sure to scrape down the sides of the bowl if needed. With the mixer on low speed, slowly add the dry ingredients. Mix until just combined. Use a large spoon to stir in the chocolate chips. Scoop out about 2 tablespoons of the dough (I used a cookie scoop) and roll it into a ball. Place the dough balls on nonstick baking sheets 2 inches apart. Bake until cookies are set around the edges and slightly golden, 10-12 minutes. Allow the cookies to cool on the sheets for 5 minutes, then remove them with a spatula and place on a cooling rack. So, Seriously Delish? You want it. Oh! And, check to see if Jessica is coming to your town on her book tour. I went to the one in Houston, and not only is Jessica a doll, but the entire crowd was just so delightful. I feel sure it's the same in every city...Jessica brings the fun with her. Seriously Delish. Mom tested, kitty approved. Oh my goodness! I am in love with your kitty!!!!! Oh my gosh, Spike!! Cracking me up! I love Jessica's new book so much! These cookies look fantastic! O.K., if your words about this book and the photos inside didn't sell me on it, the pictures of Spike *reading* it did! Love love love Jessica's blog. These cookies look perfect. And Spike is adorable! Oh my, those look amazing. I'm going to cave soon and buy that book. Do you know if you can make oat flour at home by grinding up oats? The cookies look yummy and your cat is adorable. ohhh! it sounds great and looks so delicious!! OMG! I can smell it ! :D great pics!! and receipt jummie !!!! Chocolate chips cookies are a must-have in the holiday season coming up! Can we talk about Spike? Would you please do a post about him, please??!!! Spike is adorable. Is he what is called a "tuxedo cat"? Spikey Boy knows a good cookie when he sees one! Can't wait to get Jessica's book! Spike is a sweetie pie! Pinned him to my Cats page!